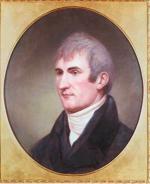 Meriwether Lewis was born in the shadow of Thomas Jefferson's Monticello and raised in the wake of the American Revolution. Lewis, who lost his father in the War for Independence, always knew Jefferson as a neighbor and a family friend, and also as a gentleman farmer after Lewis inherited 2,000 acres of prime Virginia land when he was eighteen years old. But Lewis was too restless for plantation life. He made a name for himself as an Army officer on the frontier, volunteering in 1794 to help put down the Whiskey Rebellion in western Pennsylvania. By 1800, the year that his neighbor was elected President of the United States, Lewis had achieved the rank of Captain. 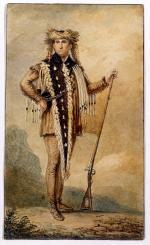 Meriwether Lewis in expedition garb, by Charles BJF Saint-Memin, 1807. Jefferson soon appointed the twenty-six-year-old Lewis to be his correspondence secretary. Experience on the frontier was valuable in the White House, with the British, French, and Spanish threat increasing along the Mississippi. Lewis" appeal to Jefferson was his "knowlege of the Western country, of the army and of all its interests and relations." But the President, and no doubt Lewis as well, had something else in mind besides correspondence. As the nation's chief executive, Jefferson now had the necessary power and influence to mount an expedition that would cross the Mississippi and march to the Pacific Ocean, a project Jefferson had attempted to organize several times before. In fact, Jefferson rejected Lewis as "too young" when he volunteered in 1793 for the failed Expedition led by Andre Michaux. A decade later, with the plan to acquire Louisiana underway, Jefferson's longtime objective was within view and his choice for its leader was clear. Lewis clearly had the requisite political and military background for the expedition. All he needed was to refine his ability to grasp the proposed expedition's intellectual, scientific, and ethnological objectives. Towards this goal, Jefferson guided Lewis to Pennsylvania to meet with leading scientists, naturalists, and other experts. First, Lewis traveled to Lancaster to meet with the great American surveyor, Andrew Ellicott, who had just recently completed the plan for the city of Washington. After many months of planning, Lewis led four boats down the Ohio River from Pittsburgh in the late summer of 1803. For the next three years, Lewis and his friend, William Clark, led an Expedition that explored the continent. Lewis" planning and leadership helped ensure that he, Clark, and the Corps of Discovery survived the 8,000-mile roundtrip journey up the Missouri River, across the Rocky Mountains to the Pacific Ocean, and back. And it also resulted in the acquisition of an enormous amount of information on the geography, culture, and natural history of North America. Four years after Lewis visited Philadelphia to plan for his Expedition, he returned to the city to make certain that his Expedition journals, observations, data, and specimens would be properly interpreted and collected for perpetuity. Lewis got commitments from scientists, ornithologists, and botanists to help with the interpretation of his discoveries, and secured John Conrad to publish a three-volume history of the Expedition. To illustrate the publication, he sat for a portrait by Charles Willson Peale. He turned to Alexander Wilson for paintings of birds, and relied on Charles B. J. Fevret de St. Memin for sketches of Indians. Lewis made sure that everyone, especially the members of the American Philosophical Society, were aware of his plans. Everything seemed to be in order by early June, when Conrad printed and distributed a prospectus that announced the project. The world would soon know just how well the United States understood and appreciated its vast new acquisition. But Lewis" plans were soon thrown off course by a series of diversions and distractions. Appointed Governor of the Louisiana Territory by Jefferson - a position he never particularly wanted or enjoyed - Lewis became engrossed in western affairs. While he made no progress on the official history, less informed narratives of the Expedition went into print, including the journal of Expedition member Patrick Gass. People who had promised to help Lewis with his own publication backed out of the project. Disappointed and even further behind schedule, Lewis, who had always struggled with alcohol abuse and depression, began a downward spiral. After two years with no sign of progress, a frustrated Jefferson wrote to Lewis, demanding to "know when your work will appear. Every body is impatient for it." In truth, Lewis had not been able to write a single page. Troubled, drunk, depressed and near suicide for months, Lewis" condition deteriorated during a trip to Washington, D.C in late 1809. In the second week of October, while staying at an inn seventy-two miles from Nashville, Lewis took his own life. Stephen E Ambrose, Undaunted Courage: Meriwether Lewis, Thomas Jefferson, and the Opening of the American West (New York: Simon and Shuster), 1995. Paul Russell Cutright, Lewis and Clark: Pioneering Naturalists (Chicago: University of Illinois Press), 1969.